Casa Carrari offers a spacious apartment with 3 bedrooms with a total of 6 beds plus a baby bed, kitchen / meals, living room and bathroom with toilet, shower, tub and bidet. Gem is the large terrace which runs along the whole apartment and on which one has direct access from every room. 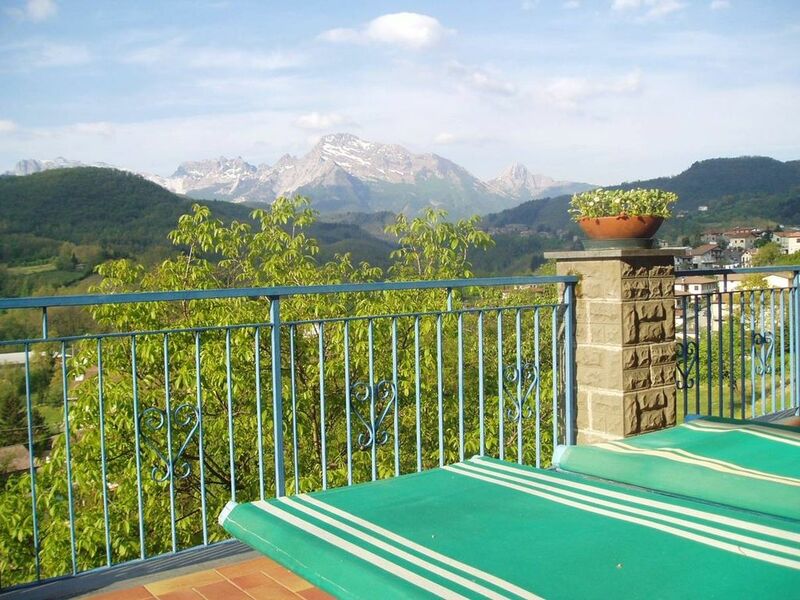 Enjoy there the panoramic view of the unobstructed views of the surrounding hills and the marble mountains of Carrara. In front of the house is the vineyard of the German-speaking landlord. You will be inaugurated by him into the mysteries of wine and grappa production. He willingly gives you tips for trips and good restaurants. Special price from 9. 9.2017: 300 Euro / week. Sunbeds and umbrellas are available. If you want to grill, is wood. The apartment is well suited for families: baby bed, high chair and various toys for smaller children can be found in the apartment. The satellite TV, with DVD player, also has German channels. The house is situated at the entrance of Piazza al Serchio and is still only around 500 m from the village center. There are approximately 700 m to the station. This versatile apartment is perfect for a short break for two as well as a cost-effective alternative for families, with plenty of space to relax. Only 17 km away is Castelnuovo, the center of the Garfagnana, with many shopping facilities. Recommended are day trips by car or train to Lucca (60 km), one of the best preserved medieval towns in Italy, according to the leaning tower of Pisa (80 km), the sea (80 km) or in the Cinque Terre. Or go to the mountains and hike in the national park Orechiella. Especially popular in the area is mountain biking. The owner speaks along with Italian and German. Various toys for small children. Washing machine in the basement for the entire house. Sun loungers and parasols on the terrace. Wooden barbecue in the garden. Wood is provided by the landlord. Stove: 2 electric hobs plus 4 gas plates. Plus microwave oven. Parking inside the closed fence. Satellite TV with many international channels. The owner lives in the same house and also speaks German. Fabulous 2nd time here. Will come again. Once again we had a lovely time here. Our second visit. Beautiful area and Fernanda & Fabio are wonderful friendly hosts. We were a family of five, staying here for over a week. This place is located in the mountain countryside of Tuscany. You need to have a car. When we arrived we were met very graciously, and made sure we settled in OK. The website did not say it had wifi, They do have wifi, and I had no problem with my mac, although my wife was unable to connect with her PC. The apartment was very clean and big, it was very well stocked. The location was beautiful, and we enjoyed many meals and drinks on the patio with Amazing views! The hospitality we received from the Carrari Family was second to none! We have traveled through Europe for over six months and have never received such hospitality anywhere! They made us feel like family! Judging by their internal comments book in the apartment, many families felt the same. They made sure we had whatever might have been needed. If you are looking to stay in the Tuscany countryside, you would be doing yourself a great disservice if you did not stay here! It was a fantastic base to visit Luca, Pisa, and Florence. There are also many places to hike, a beautiful lake for swimming and beautiful national park to enjoy. We will definitely be back! Schöne weitläufige Wohnung mit allem was man benötigt. Sehr nette und hilfsbereite Vermieterin. Wir haben es sehr genossen. Die Wohnung ist noch schöner, heller und geräumiger als die Bilder vermuten lassen. Besonders erwähnenstwert ist die riesige Terrasse. Man hat außerdem nicht das Gefühl, in eine funktionelle Ferienwohnung (abgezähltes Geschirr, spartanische und zweckmäßige Einrichtung) zu kommen, sondern man fühlt sich, als würde man kurzzeitig in eine belebte Wohnung ziehen, so umfassend ist die Ausstattung. Die Vermieter Fernanda und Fabio sind wahre Herzchen. Ihre Gastfreundlichkeit ist überragend. Uneingeschränkt empfehlenswert! Eine vollständig und sorgfältig eingerichtete große Wohnung mit herrlicher Aussicht auf die umliegenden Berge; ruhig gelegen und günstiger Ausgangspunkt für Wanderungen; gut funktionierendes WLan; Sigr. Giorgio und Sigra. Fernanda sind die sehr liebenswürdigen und hilfreichen Vermieter, die uns einen sehr angenehmen Aufenthalt beschert haben, wofür wir uns auch an dieser Stelle vielmals bedanken wollen. The village Piazza al Serchio counts about 1000 inhabitants and is a small regional center. It therefore has various shops such as grocery stores (Supermercato), banks, pharmacy, post office, clothes shops, hairdressers and reasonably priced restaurants and pizzerias, where traditional Italian cuisine is maintained. Every Tuesday is held each a small market. Around 17 km away is Castelnuovo, a medieval town that is the center of the Garfagnana. Large weekly market is on Thursdays. A little further away is Barga, also a nice small town, every August performs an international jazz week. The area is ideal for hiking and mountain biking. A National Park will begin in about 15 minutes away. Attractions are also a tree-climbing park in San Romano, the stalactite height Grotta del Vento, longest stalactite in Europe, or the marble quarries of Carrara. For bath in summer invites you to the Lago di Gramolazzo, which is approximately 7 km away. A small bathhouse is located in the village itself. Piazza al Serchio is a perfectly located village for exploring the Garfagnana. Golf: Only 15 km away is the 6-hole golf course in Garfagnana Pontecosi. Challenging 18-hole golf courses are in the Versiglia, z. B. between Lucca and Pisa, approximately one and a half hours away or in Montecatini (towards Florence). Die Nebenkosten Energie, Bettwäsche, Küchenwäsche und Endreinigung sind in den Preisen inbegriffen. An- und Abreisetag in der Hochsaison ist üblicherweise am Samstag. Je nach Belegung sind jedoch auch andere Tage möglich - fragen Sie einfach an. Ausserhalb der Hauptsaison bei Buchung von mindestens 7 Nächten Beginn an jedem Wochentag möglich.